Although we work with the “head”, relying dominantly on inner mental functions to get our work done, the approach at workplaces to this vital resource has been of a reactive type – becoming highlighted only when serious mental health problems emerge. The approach to mental wellness needs to be very systematic and proactive. It also needs to be practical and provide useful knowledge-tools, so that of all staff can mobilize and keep their inner mental capabilities in good shape. When everyone is equipped with methods to effectively handle every-day challenges as they emerge, pressures will not escalate and seeds of illness can be kept away. Flexible working arrangements, taking a vacation and doing breathing exercises are good enough for a quick-fix, but in the absence of practical intrapersonal skills, remain only compensative in nature. In average a company already loses 700-1000 € / per employee every year because of stress, burnout and mental ill-health2. Imagine those losses stopped? More than 80% of people are not engaged or passionate about what they do for work3. However, they do not need more motivation training. Instead, people are overwhelmed with stress, burning out or struggle otherwise with handling their inner mental reactions. Boredom and indifference are not physical issues, right? Reinforced with skills to stop stress from escalating, a big portion of those people can easily be won back. Everyone who can do the maths, understands the differences in revenue when there would be 60% of engaged and motivated workforce instead of the current 20%. Costs to presenteeism (showing up to work, unable to perform at a personally optimal level) are higher (58%) than those of absenteeism (33%) or workforce turnover (9%)4. The study by Killingsworth & Gilbert highlights that 50% of the time our mind is wandering5, 91% of people attending meetings admit to daydreaming6. Since awareness is the tool everyone uses for concentration and time-management, education about it's practical application is a must, enabling people to restore their productivity independently. When people are unwell at work, they report decreased ability to get stuff done (62%), being not engaged (63%) and unmotivated (62%)7. Too often ‘mental health’ gets confused with ‘mental illness’. The two couldn’t be more different. Mental health is something that every person has, when their inner functions operate in the most optimal manner. It is a level of psychological well-being. Mental illness is lack of health – a result of not dealing with the problematic way of functioning in time due to absence of specific education – the intrapersonal skills. Illness is a direct result of neglecting the need for proactive education, a biased focus to prioritize fire-fighting the consequences. As the topic of illnesses is often also stigmatized, people postpone speaking up and getting help. If we as society do not pay more attention to normal mental functions and wellness, do not reach for skills to sustain it (and for professional help, if an illness has already formed), then the escalation of mental illness into an epidemic cannot be stopped. In fact, when somebody uses a name of diagnose in a sentence, it is not any longer about wellness, but illness. 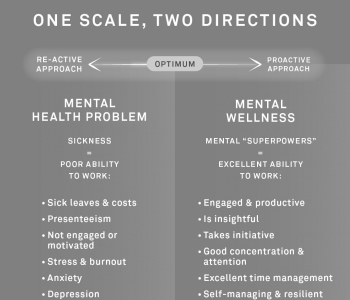 Good mental health equals wellness, optimum inner functioning and effective use innate potentials: purposeful attention, embracing the change and unknown, initiative, creativity, inner motivation, having insights, awareness of emotions, good time-management and more. These are all specific inner capabilities, developed into skills with a to well-crafted curriculum. Mental wellness is a proactive approach, just like going to the gym is good physical health and overall wellbeing. What you and your team need in this sense, is a mental wellness gym for your learning knowledge-tools and practices to direct own inner functions and the brain! Although personal responsibility over one’s mental state is elementary, it would be naïve to expect people to be able to apply skills that they have not learned yet. In the situation where there is almost no practical education about mental wellness at schools and the wellness-centered proactive education side is not the “business” of medicine either, it only leaves companies and organizations capable of filling in this major gap in education. People spend most of their waking hours at work and employers need people who are mentally well capable to perform their tasks. The next thing to be developed is not a technology nor a rocket to enter outer space. The next most crucial development concerns understanding and upgrading the human mind – practical skills to direct inner mental functions. To the surprise of most people, the solution is not something waiting on the shelf, ready to be used. Employers have equally limited knowledge about inner mental functions and what makes them operate in non-optimal way, as have employees. Mental health professionals have been focused more to illnesses (diagnosing and treating them) than to wellbeing. Apart form enthusiasts like Dr. Helena Lass and a handful of others, systematic approach to proactive mental wellness has not reached even the phase of "baby-steps". Empower your staff - where to start? Dr. Helena Lass has written a scientific article about this topic, which will be featured in a forthcoming newsletter next year. Until then, her practical method is already available across globe – a gym for your brain, Wellness Orbit e-training platform. This mental wellness gym is now open 24/7 and with the potential to simultaneously train tens of thousands of people in a totally new and proactive way. 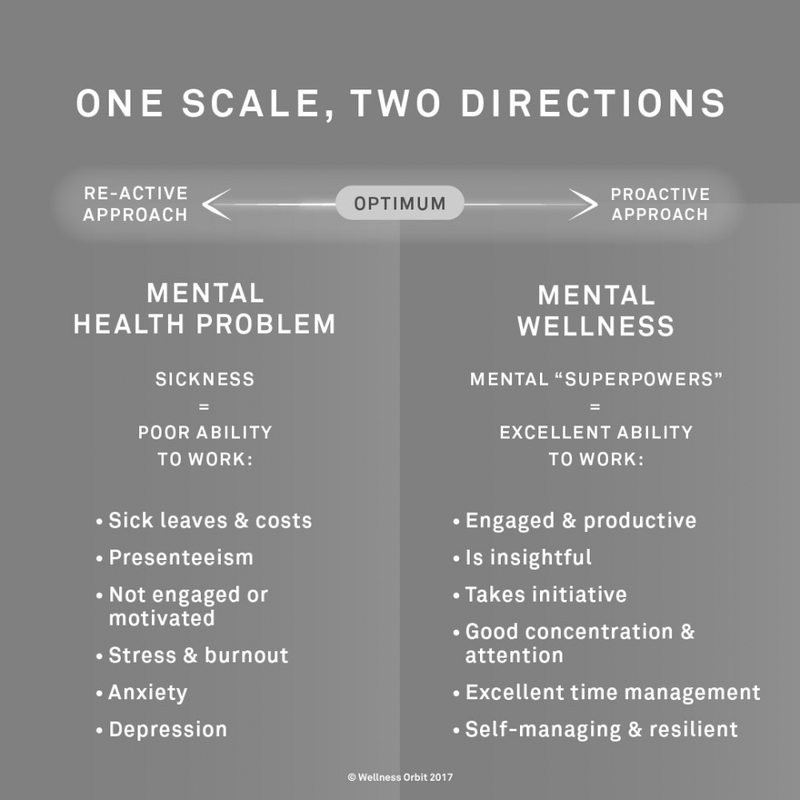 Focusing on mental wellness is an opportunity to positively influence the lives of all employees, entrepreneurs and achievers. Everyone can have mental superpowers like the ability to differentiate and focus, access to deeper insights, intuition and creativity. However, those abilities need to be trained regularly, just as your muscles do. This is why we turned to technology – to provide regular and continuous build-up of skills, now only a few click away! If you would like to discuss a tailored mental wellness training package please get in touch with us: wellnessorbit@consciousinitiative.com. 5. Killingsworth & Gilbert, Published in Science 2010, "A Wandering Mind is an Unhappy Mind"